I thought Rony was a featherweight? Dude is looking like middleweight in the video. 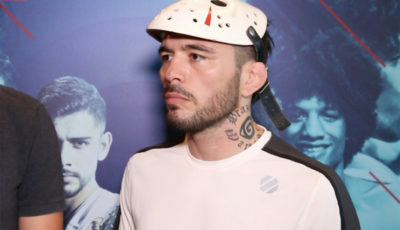 UFC featherweight and The Ultimate Fighter: Brazil 1 winner Rony Jason has been caught on video punching a woman on the ground during a party in his hometown of Quixada, Ceara, Brazil. The video was posted on YouTube on Sunday by Tudo Sobre MMA and shows Jason not only hitting a woman several times, but having to be held back by many other men. So far, there have been no announcements from the UFC or Jason regarding the incident. It is unknown whether or not Jason is still on the UFC roster. I don’t think Uncle Dana will allow such behavior.